PAUL Kane, of campaign group Forever Hibernian, says he is ready to launch a community-based takeover of the Edinburgh outfit, describing Hibs as a club “on its knees”. However, Kane, who played more than 300 matches for Hibs, has emphasised that supporters will have the ultimate say regarding whether he pushes forward with his latest plan to prompt power change at Easter Road. Supporters Direct Scotland (SDS) are currently running a survey on their website aimed at gauging the opinion of the beleaguered Hibs fanbase. Among the topics tackled within the questionnaire are whether fans are seeking representation on the board, if they would be willing to contribute to a paid membership scheme and whether supporters would actively participate in a bid to buy the club outright. 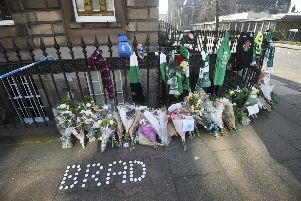 Hibs chief executive Leeann Dempster has already expressed a willingness to work towards community ownership or, at the very least, fan representation on the board. “This is a pivotal moment in Hibs’ history. The club is on its knees and our fear is it will sink even lower. We didn’t think the mismanagement could get any worse, but it has,” said Kane. “Sir Tom Farmer has always claimed he saved the club for the community. We are now offering him the chance to live up to these words. “Over the past few weeks we have had meetings with [SDS chief executive] Paul Goodwin and Supporters Direct over options for fan and community ownership. “If the final results of the survey demonstrate a desire to explore the options, then a new united group will be formed with an independent chairperson who will plan future events with Supporters Direct Scotland. Former Kwik-Fit tycoon Sir Tom Farmer possesses 90 per cent of the shares in HFC Holdings Ltd, Hibs’ parent company, while non-executive chairman Mr Petrie holds the remaining ten per cent. Kane’s announcement comes amid clear tensions within the Hibs fanbase. Leeann Dempster began the process of consulting with supporters this week, but the meeting at Easter Road on Tuesday evening became heated after it was hijacked by several protesters demanding Petrie’s resignation.